I’m not sure what to call these. Cheese pockets? Cheese rolls? Basically, we took pizza dough flavored with garlic salt and shaped the dough into 2 to 3 inch rounds, filled the round with cheddar cheese and either mushed everything together or folded the dough over, according to whoever was making the cheese something. Then I baked the pockets at 375 for about ten to fifteen minutes. 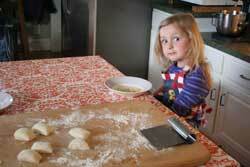 This turned out to be a great way for the kids to help in the kitchen. 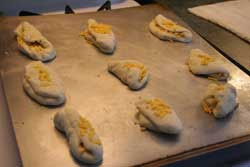 Both my three year old and my six year old were able to make the cheese pockets mostly by themselves. Here’s my three year old daughter waiting patiently for the cookie trays to come out of the oven. After the pockets baked, the kids dipped them in spaghetti sauce using a set of small glass bowls that I found at Ikea.